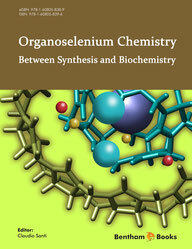 Scientific Interest of Prof. Claudio Santi is mainly focused on the Chemistry of organoselenium derivatives. 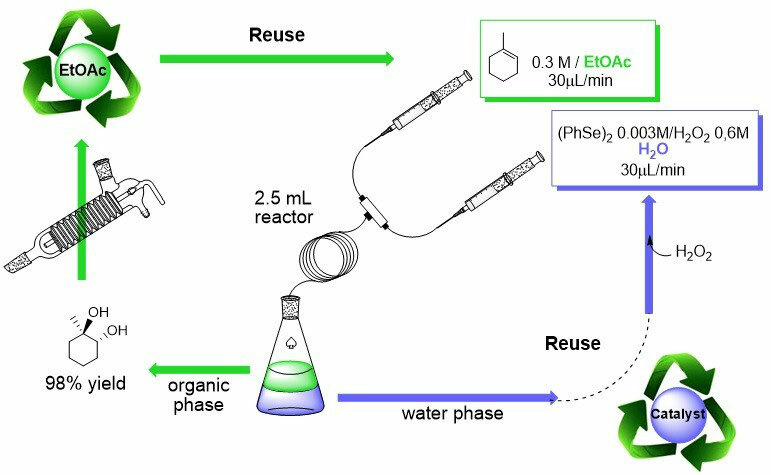 After a lot of work devoted to the optimization of catalytic “one-pot” selenenylation deselenenyation reaction and to the asymmetric synthesis promoted by optically pure diselenides more recently the scientific efforts have been directed to the use of organoselenium reagents and catalysts in green chemistry and in the evaluation of the biological activity of different class of organoselenium compounds. Some example are reported below. 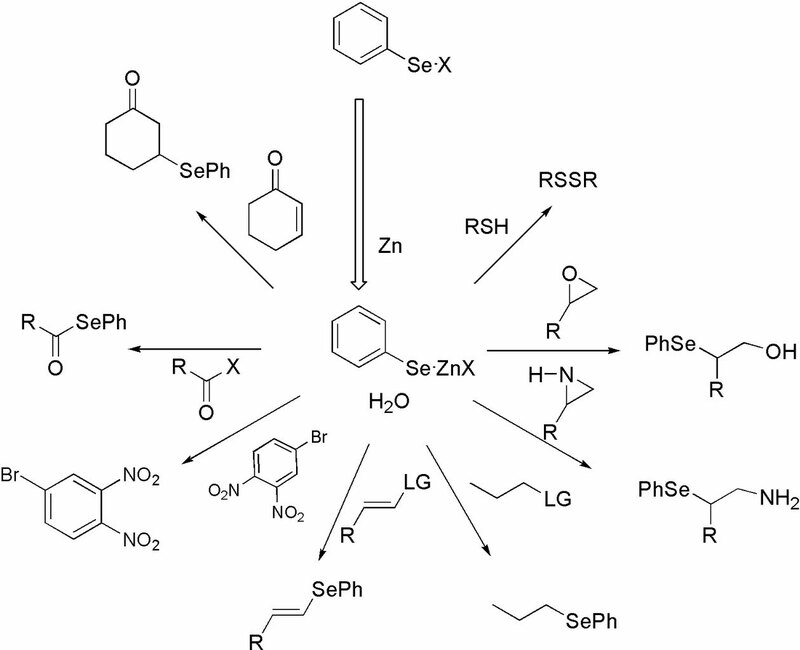 The synthesis of a novel class of zinc chalcogenates has been obtained via oxidative insertion of elemental zinc into chalcogen halide bond. 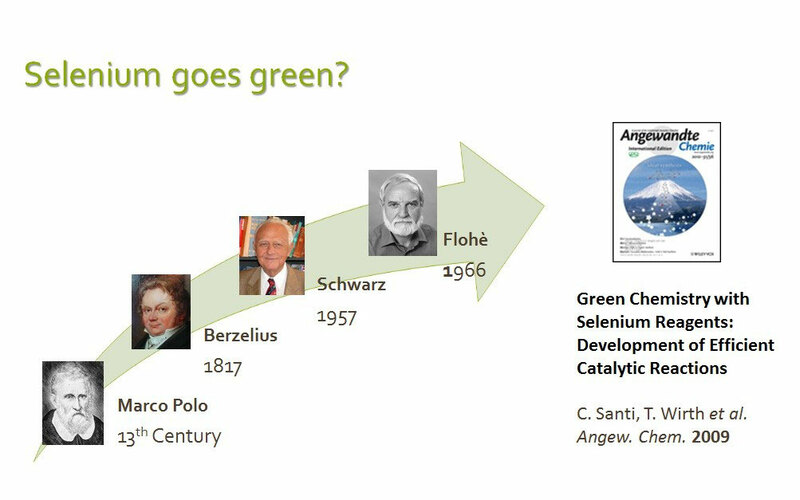 The reaction proceeds in high yield and with 100% of atom economy affording the umpolung of Selenium of Sulfur containing electrophiles. 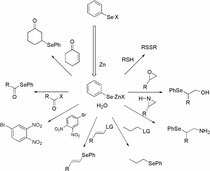 The resulting compounds represent the first series of selenolates and thiolates that were isolated as stable and odorless solid reagents. They were successfully employed for the nucleophilic introduction of selenium and sulfur containing functional group in “on water” conditions. Nucleophilic substitution of aliphatic, aromatic acylic and vinylic substrates as well as Michael type addition reactions to double and triple bonds can be easily obtained using water as activating and reusable medium. Taking inspiration from the mechanism used by the glutathione peroxidase to reduce peroxides, a general and efficient protocol for the oxidation of C=X double bond can be obtained using diselenides as pre-catalyst. The oxidation of olefins to the corresponding 1,2 diols can be realized using Hydrogen Peroxide as stoichiometric oxidant and water as medium. The actual catalyst is a water-soluble selenenic/perselenenic acid and, conseguently, after the extraction of the organic substrates/products with EtOAc the water containing the catalyst can be reused several times reducing the overall production of chemical wastes. In addition, Hydrogen Peroxide is commonly considered as a green oxidant because it produce as side product a molecule of H2O. Perform reactions under flow continuous rather than in batch mode has led to considerable improvements regarding safety and sustainability. 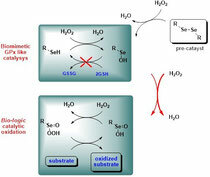 Water soluble and reusable catalysts as well as supported heterogeneous selenium catalysts have been used to enhance the greenness of the hydrogen peroxide mediated reactions in the sinthesis of vicinal diols. 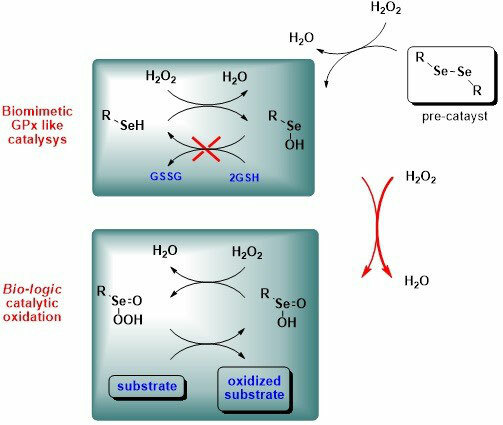 The ability of several selenium containing derivatives to oxidize glutathione in the presence of hydrogen peroxide has been evaluated and correlated to the GPx-like activity of these derivatives. The kinetics of the GSH oxidation can be followed by NMR in D2O as solvent. 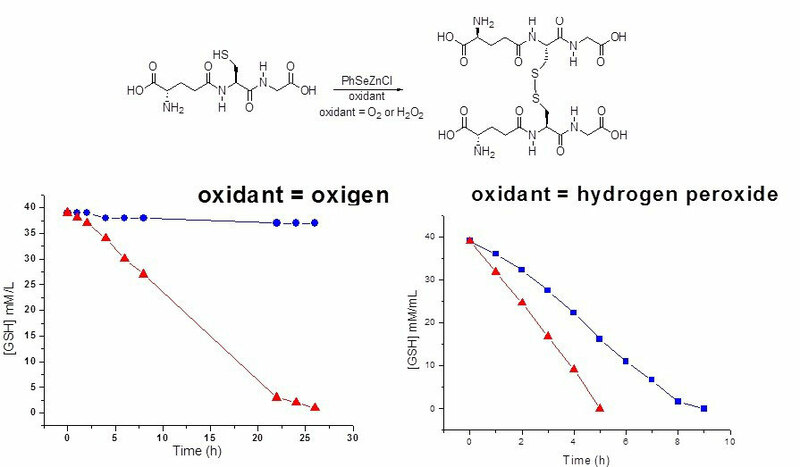 As reported in the scheme for PhSeZnCl the oxidation mediated by the oxygen is considerably slower than that mediated by peroxides indicating a good control on the balance antioxidant/pro-oxidant properties that are probably due to the presence of the zinc. Biological essay were lso performed confirming the activity predicted by NMR and that in some cases are much more higher than that of Ebselen.